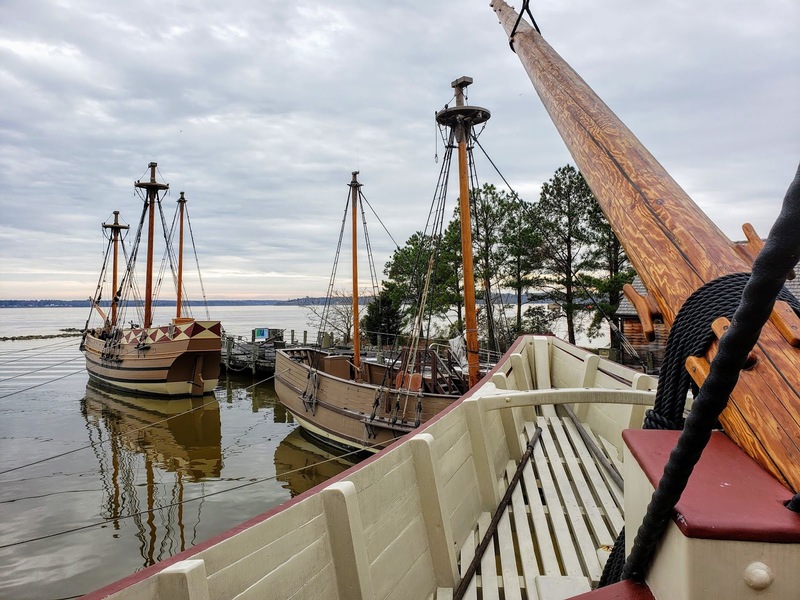 Jamestown Settlement is a living history museum operated by the Commonwealth of Virginia. If you're looking for a way to introduce kids to American history, start here. There's plenty to see, and the history lessons are snuck in, presented in a variety of different ways, so there's little chance anyone will get bored. It's great for kids, but also worth visiting for adults. At Jamestown Settlement, you'll find a recreation of the original James Fort, depicting the fort as it probably looked like between 1607 and 1614. 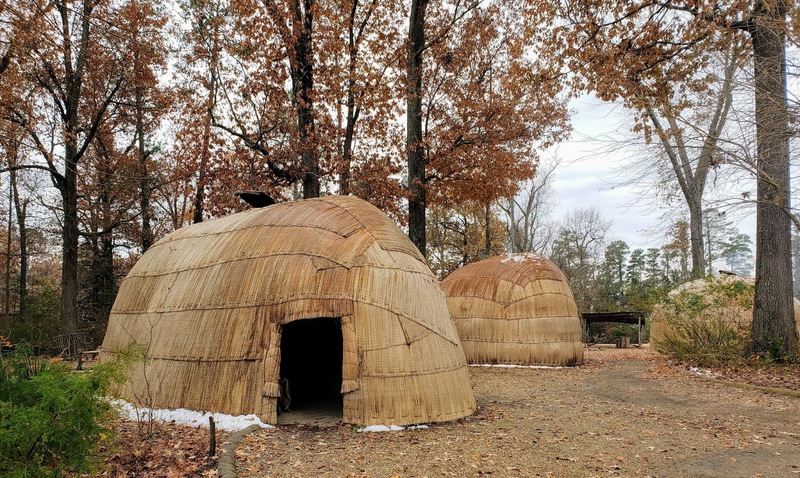 In addition, there is a Powhatan Indian Village, where you can go into the buildings and learn more about what life was like for the Powhatans. 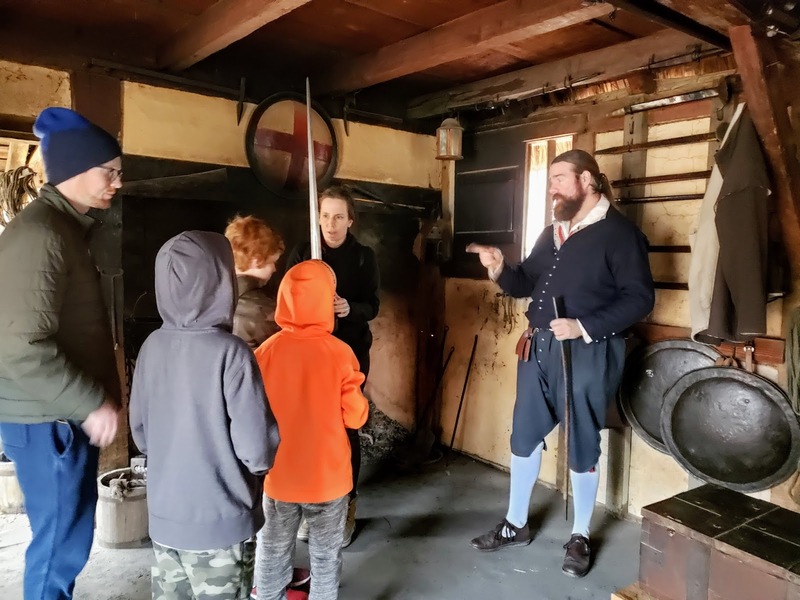 Throughout both the recreated village and recreated fort are re-enactors, who provide demonstrations and explanations about what you're seeing. A view out of Susan Constant's bow over to Godspeed and Discovery (in front of the other two ships). Probably the coolest displays are the full-size, floating-on-the-water replicas of the original settlers' ships: Susan Constant, Godspeed, and Discovery. 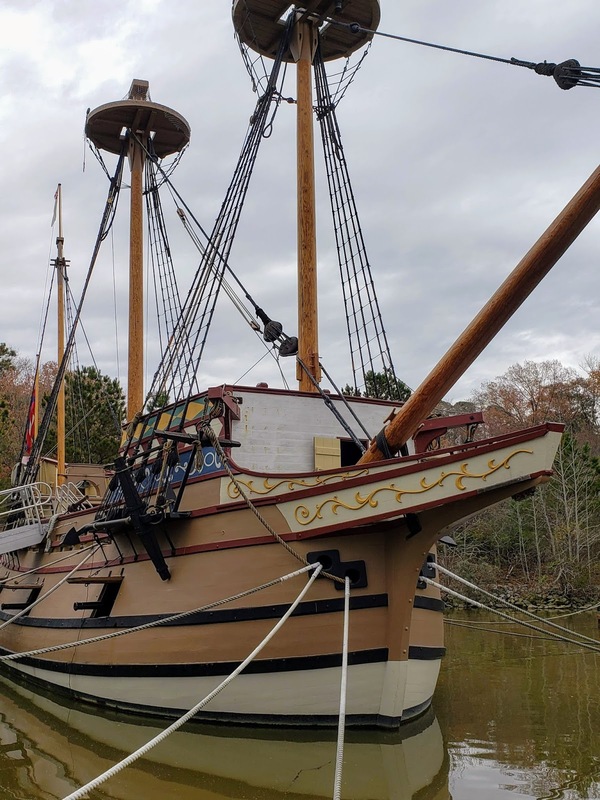 The Susan Constant was the largest of three ships of the English Virginia Company on the 1606 - 1607 voyage that resulted in the founding of Jamestown. She carried 71 colonists, all male, including the well-known John Smith. On June 22, 1607, the ship faced east for the return voyage back to London, captained by Christopher Newport and accompanied by Godspeed, leaving behind the 104 colonists and only the aptly named Discovery so the colonists could explore the area. Discovery -- also referenced as Discoverie -- was the smallest of the three ships. 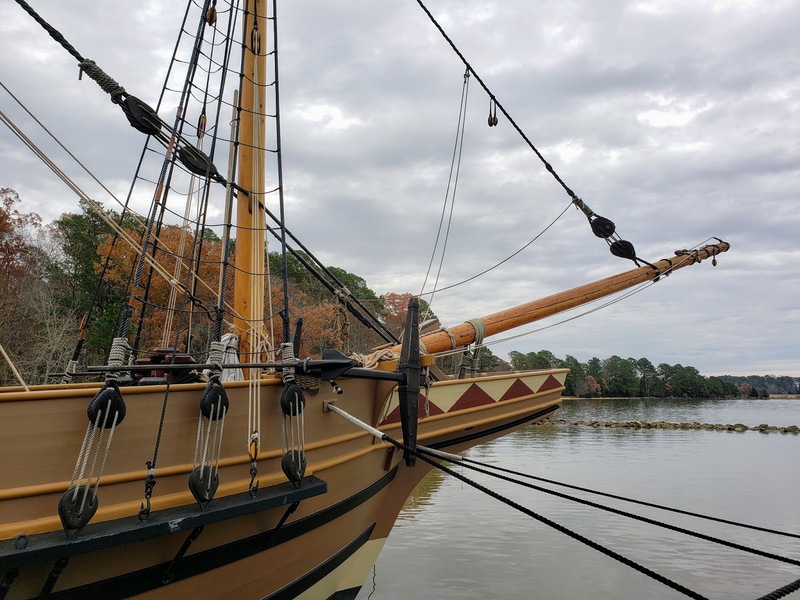 In summer 1608, in the months between the first and second supply missions, Captain John Smith left Jamestown on Discovery, ending up exploring the Chesapeake Bay region as he searched for badly needed food. Via this voyage of, ahem, discovery, Smith was able to create a map of the region that served explorers for more than a century. The Powhatan Village, as one of their villages might have looked when the Europeans landed in 1607. 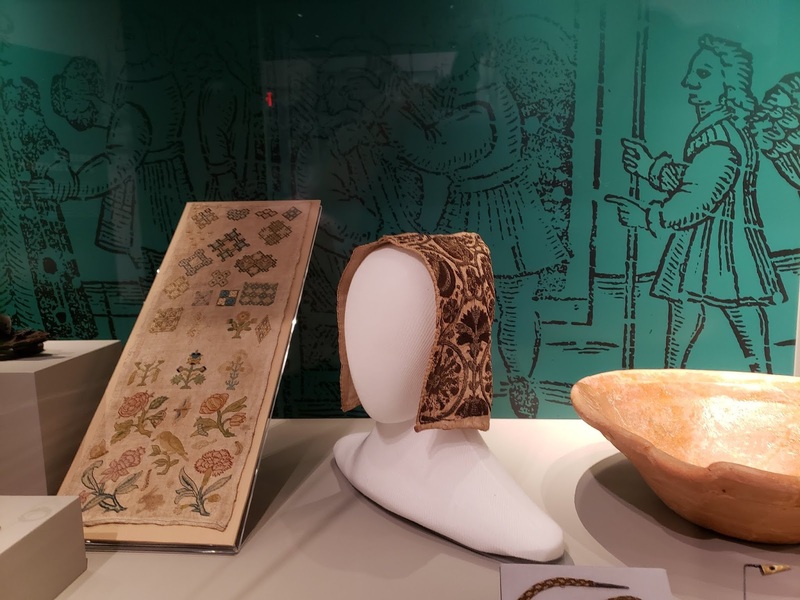 The Jamestown Settlement galleries exhibit a varied collection of objects relating to the nation’s beginnings in 17th-century Virginia. 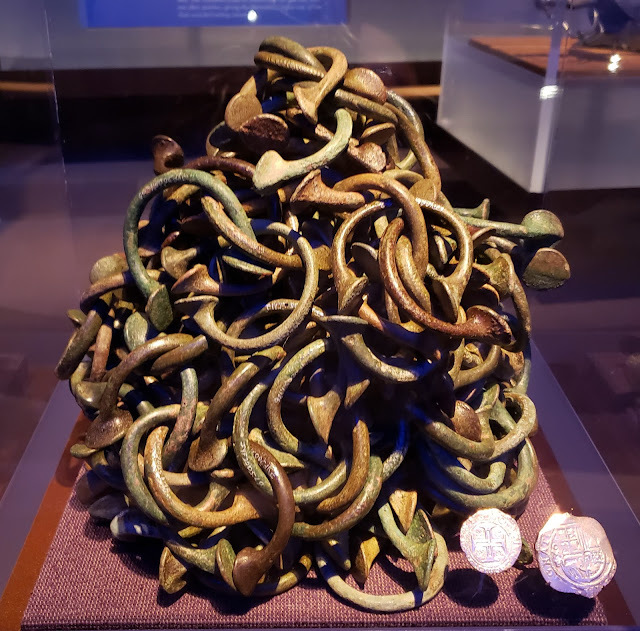 A pile of manillas, commonly used as currency in the slave trade in the 1600s. This pile was roughly worth the cost of a single, enslaved individual in 1681. 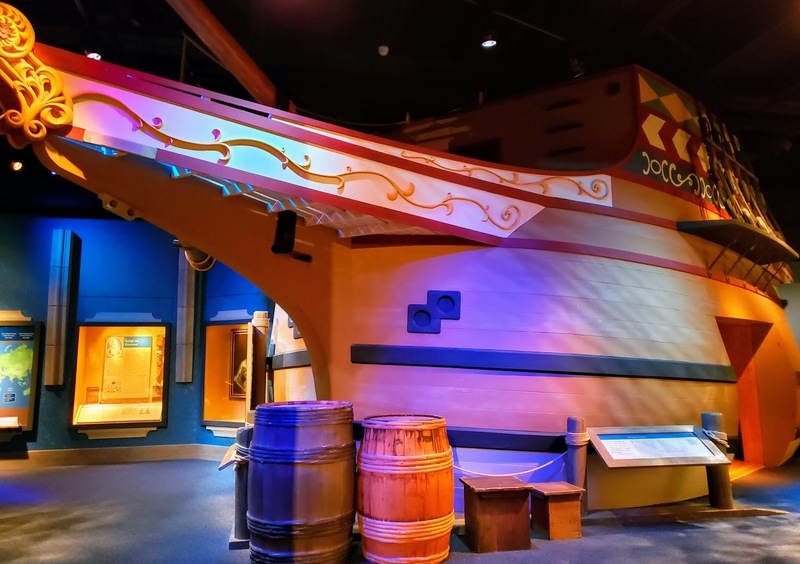 I thought the galleries were really well done -- plenty of history and facts to appeal to adults and history buffs, but colorful and artfully displayed so as to excite a child's imagination and help the viewer understand how the artifact fits into -- or helps explain -- history. Although I enjoy history, I have a short attention span, so I appreciated the exhibits, which included both static and interactive displays. At one point you feel as if you're walking through an English village; another leafy display recreates the sense that you're in a Powhattan village. 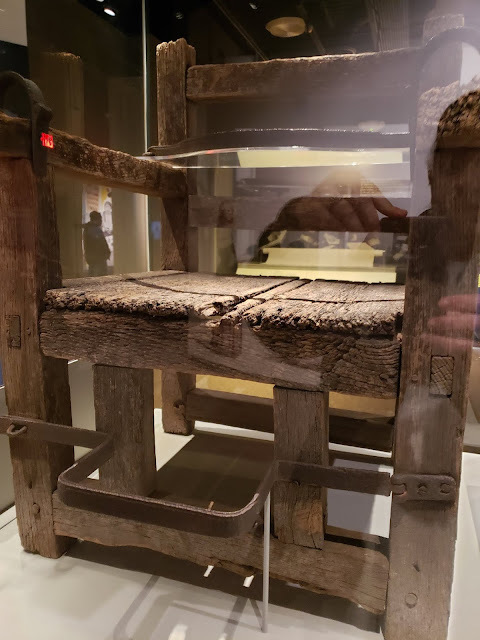 I was fascinated by the Tenacity Special Exhibit, which will be on display through January 2020 and focuses on the women of Jamestown and early Virginia. My only criticisms is that I wished that there had been even more for this interesting discussion on women's lives and roles in colonial Virginia. The Jamestown-Yorktown Foundation collection supports the museum’s storyline and includes objects representative of the Powhatan Indian, European, and African cultures that converged in 1600s Virginia. 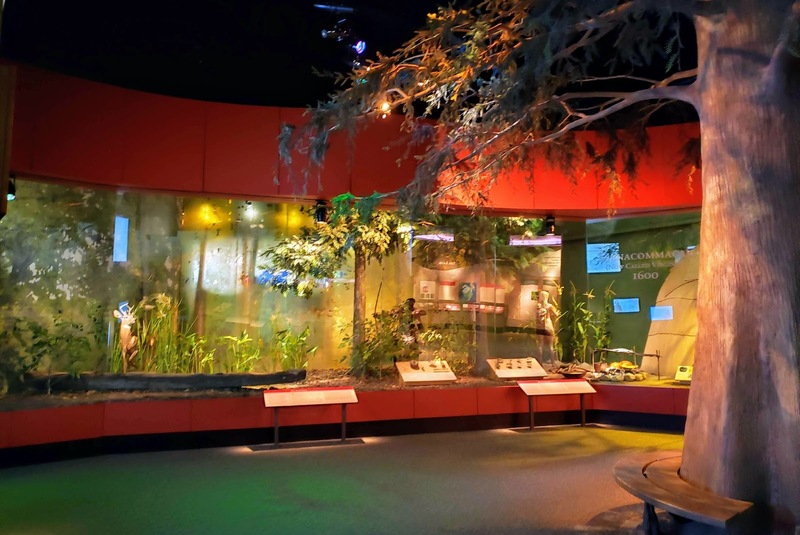 More than 500 artifacts are exhibited at any one time in the galleries. such as expressing opinions, their "brabbling tongues," or gossiping. Plan on spending a couple of hours there. 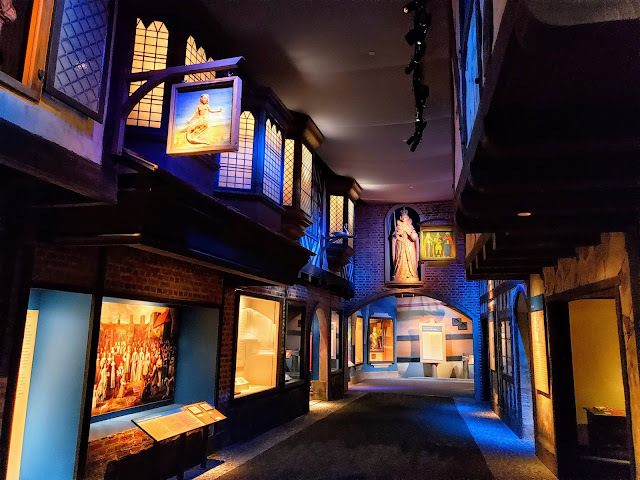 We went off season (way off season), and the place was virtually empty, which is why I'm now a fan of going to museums off season -- I didn't need to be patient with any stranger lingering overlong in front of a display or explanation! Even though there were re-enactors, not all three ships were open to be boarded and explored. I imagine that there might be lines and crowds on beautiful weather weekends, so factor that into your plans. There are multiple restrooms, as well as a cafe for refreshment, if you find yourself spending more time there than originally planned. Know before you go: Avoid crowds by going off season and practically having the place to yourself! Also, Historic Jamestown -- the real location and archeological site of the Jamestown settlement, is nearly adjacent to Jamestown Settlement, and makes a good pairing if you want to spend the whole day. Hours: 9 a.m. to 5 p.m. daily (until 6 p.m. June 15 through August 15). Closed Christmas and New Year’s day. Follow the MidAtlantic Day Trips Blog on Facebook, Instagram, Pinterest, and LinkedIn.